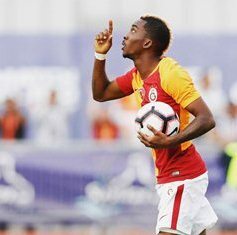 Everton loanee Henry Onyekuru was in action for 86 minutes Friday evening as his Turkish Lig side Galatasaray let go a two-goal lead and pegged back by Fenerbahçe in a thrilling 2-2 draw at the Turk Telecom Stadium. The game was the 11th of the season for the Nigerian striker who was substituted off in place of Algeria forward Sofiane Feghouli. Onyekuru struck a low shot with the inside of his foot four minutes to halftime from a tight angle but the ball went agonizingly wide off target. The Nigerian's fierce effort in the 49th minute was deflected off for a corner kick which culminated in the team's second goal scored by Norwegian defender Martin Lines. With eleven left on the clock Onyekuru found Sinan Gümüs but the Turk's low shot went whiskers away from being the match winning goal. There was on field flashpoint as players from both sides had to be separated by stewards following an exchange of words between Morocco international Younis Belhanda (Galatasaray) and Roberto Soldado of Fenerbahçe. Onyekuru is on standby in Nigeria's latest squad for the 2019 AFCON qualifier against South Africa away on November 17.